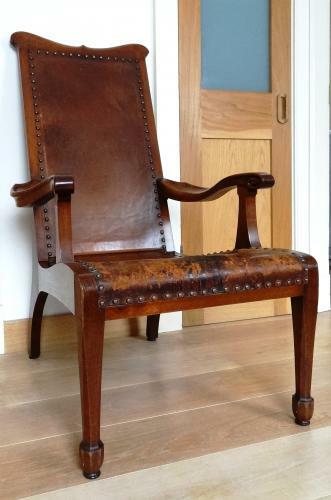 An excellent walnut (poss mix of walnut & mahogany) framed & leather easy chair; beautifully carved. Designed and made by Arthur Simpson of Kendal; c1918. comfort. Lovely chair back recurved bow shaped cresting rails with a central peak; the front legs terminating in octagonal spade feet. Original leather hide seat and back. Been in the same family since purchased. “ The Simpsons of Kendal” by Eleanor Davidson fig.65. “The Beautiful Furniture of the Simpsons of Kendal” by Hugh Wright; several references.